The appellation Vin de Savoie is diverse. Spread over nearly twenty communes that each specialize in eclectic grapes, it can be challenging to approach. It can also be challenging to drive from village to village, as small mountain roads, tunnels and lakes have to be circumnavigated and traversed to reach the most important villages. Jongieux is one such village. Driving east from Lyon to Jongieux takes about an hour and fifteen minutes and lands you at the eastern side of the Mont de la Charvez. Traveling north from the Chambéry valley, however, entails driving through a mountain. To get to Jonquieux from Chignin takes about 45 minutes. One drives northwest through la Cluse de Chambéry towards the Lac du Bourget — France's largest lake. There's a scenic 2 1/2-mile drive along the western side of the lake before it's time to ascend westward to a tunnel that's almost a mile long through the Mont du Chat. The steep Mont du Chat is popular among cycling enthusiasts. In 2007, Le Cycle magazine called the Mont du Chat one of the most difficult climbs in France. Upon emerging from the tunnel, there are a few more miles of winding roads to traverse northward before arriving at Jongieux near the base of Mont de la Charvaz. It is on the slopes of this mountain that the vines are planted, facing west towards Lyon rather than in the southeastern direction of Chambéry. "Marestel" is a hillside above the village where the Altesse grapes are planted. 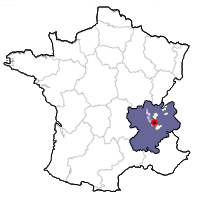 Jongieux is the "capital" of the white grape Altesse, which is the sole varietal used in the appellation Roussette de Savoie Marestel. 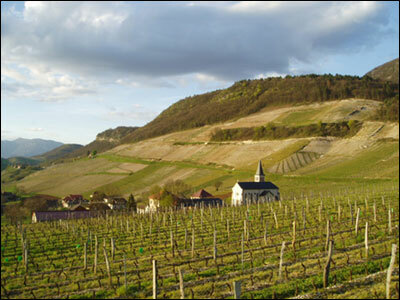 Like the valleys further south within which Arbin, Chignin and Apremont lie, the soils of the Jongieux slopes are composed of calcium rich limestone and glacial deposits.